Though it’s summertime at this very moment in real life, on Younger, our favorite publishing house is gearing up for the holiday season. Diana is throwing a murder-mystery dinner party in hopes of finding some eligible bachelors to provide some comfort during the chilly nights. Liza is coincidentally the murderer in the game and forced to lie to save face which Charles quickly calls her out on. The exchange is awkward for everyone sober enough to grasp the tension between them, but we know that he isn’t just referring to the game, he’s referring to the lie about her age. Don Ridley, a prominent journalist that has written pieces for Vanity Fair, comes to Liza’s defense. Liza is convincing in her argument, and the group votes Charles as the murderer even though he’s 100% right, she was lying. Later at the party, Don tries to score a date with Liza and after she politely declines, invites her to a People magazine watch party. Diana pulls her away because the toilet is overflowing -- a telling sign of a successful party. Meanwhile, Charles watches Don sneak food into his pocket when he thinks no one is looking, a tidbit he eagerly shares Liza the next day at work when she gets her date invite from the journalist in the mail. Diana, who is upset that Liza met a hot man during her party, makes a snide comment about 40-year-old men loving 20-year-old women, then encourages her to go. At the event, Don reveals that he has a book idea so Liza invites him to pitch it to Empirical the next day. Charles decides to sit-in on the pitch and begins grilling Don in an attempt to shut down all of his ideas. Don is understandably flustered, Kelsey is appalled and Liza is furious. “What’s his deal,” Kelsey asks Liza who is forced to admit that Charles knows the truth about her age. Fearing that Charles will start sabotaging all their clients, Liza takes matters into her own hands and tries to resign. She understands that he’s mad at her, but it's unfair for him to take it out on writers and Kelsey. Charles is adamant that he was simply turning down an incomplete book idea and that it wasn’t personal. “I’m sure you can see the difference,” he adds in a snarky manner. That night, Diana has a hot date with her plumber and former hook-up, Enzo. In case you don't remember him, he's the one she ghosted when she began her relationship with Richard. She’s skeptical to date outside of her status and even more so when she sees him pull up in a “Son of a Plumb” construction van. However, Liza, being the incredible assistant that she is, pushes Diana to give him a chance and have fun. And the date is pleasantly surprising! Enzo cleans up nice and takes Diana to a family-owned Italian joint in Staten Island. This is one date she doesn’t seem to be regretting. Back in Times Square, Charles watches Liza send off Diana creepily from a distance and then questions her to find out who knows the truth. “Only Kelsey,” Liza replies which infuriates him more because now two of his employees have been blatantly lying to his face. When Liza tries to leave to avoid his wrath, Charles offers up an apology. He admits that he lashed out at Don and that his personal feelings for in the way. Despite what she did, she's good at her job and the company needs her. Seeing an opening, Liza tries to explain her motives for lying, but Charles shuts her down. “Let it go,” he says referring to her romantic feelings for him. 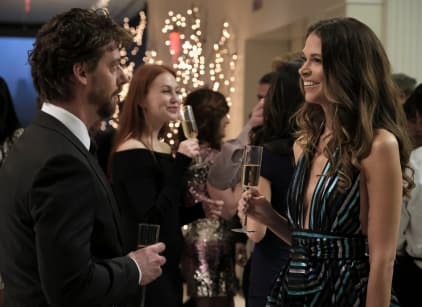 Meanwhile, Kelsey and Zane continue to mix business with pleasure and play the cat-and-mouse game with each other after he allows her to crash at his place when she gets too drunk at Diana's shindig. Liza goes on a second date with Don who is forced to come clean about being unemployed when his card declines at dinner. Seeing as she’s lied about who she was before, Liza is understanding. And when he offers to take her to yet another extravagant party with free top-shelf booze and food, she eagerly joins him. Liza: The killer would stay off the radar. Let someone else accuse and then pounce. Like you did. Charles: You sound paranoid. And guilty. Permalink: You sound paranoid. And guilty. Zane: I said crash, not smash.